One of the world's most acclaimed composer/songwriters, Burt Bacharach helped define the music of the 20th and 21st centuries. Now the three-time Academy Award winner and eight-time Grammy winner will be performing some of his greatest and most notable hits, including "Alfie," "Any Day Now," "Anyone Who Had A Heart," "Close To You," "I Say A Little Prayer," "On My Own," "Raindrops Keep Fallin' On My Head," "That's What Friends Are For," "The Look of Love," and "Walk on By." This Live @ Benaroya Hall presentation does not include the Seattle Symphony. 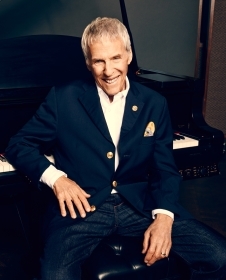 Six decades into one of songwriting’s most successful and honored careers – marked by 48 Top 10 hits, nine #1 songs, more than 500 compositions and a landmark 50+year run on the charts, Burt Bacharach’s music continues to set industry records and creative standards. Bacharach’s global audiences span several generations, and he is viewed as the unique combination of one of the greatest composers of all time and the ultra-cool cult hero of the contemporary music set who often has several songs on various music charts in many countries simultaneously. He tours the world conducting orchestras with his own musicians and singers performing his music at his sold-out concerts.